With yet another major rainstorm pelting California, water agencies around the state are preparing for flooding, as the state’s infrastructure strains under the onslaught of water. Officials are still working to lower the water level behind Oroville Dam, where last Sunday rising waters threatened to cause a catastrophic failure of the auxiliary spillway -- but another reservoir is expected to use its auxiliary spillway for the first time in 20 years, potentially causing flooding downstream. Don Pedro Reservoir, which supplies water to nearly 6,000 farms in the San Joaquin Valley, has filled quickly in the last month, rising above levels recommended by flood control engineers. Operators are releasing as much water as possible to make room for anticipated storm runoff. The lake level is hovering around 826 feet in elevation, close to the 830-foot maximum. 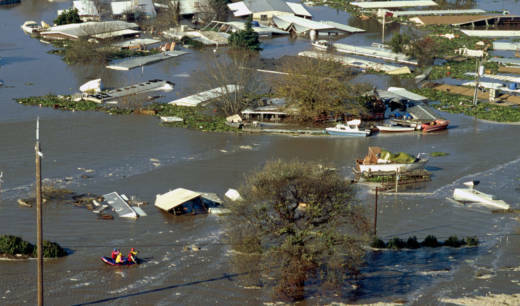 The last time the spillway was used in 1997, parts of Modesto were flooded. Still, Smart says they’re working with the Stanislaus County Office of Emergency Services to identify which areas are now at risk. “It’s tough to tell at this point, but we would expect some localized flooding at certain points on the Tuolumne River that are more low-lying areas,” says Smart. Water flow to the spillway is controlled by three 45-foot gates that lead into a rock channel that was carved out when the spillway was last used in 1997. From there, it rejoins the Tuolumne River. The dam also has an unlined emergency spillway, much like Oroville Dam’s earthen slope, over which water would flow if the reservoir fills completely. While Oroville's earthen spillway was designed to handle cascades of more than 200,000 cubic feet per second, engineers at the state Department of Water Resources were stunned by how quickly the bank melted away under just a small fraction of that force last weekend. Operators at Don Pedro got clearance from the Army Corps of Engineers to increase their releases recently, but they say the limiting factor is the narrow river channel downstream, which can’t handle extremely high flows. Reservoir managers in California try to walk a tightrope – staying as full as possible in the winter to boost their summer supplies, while also leaving enough room to capture winter storm runoff. The maximum levels during the wet season are set by the federal government, and require congressional action to change. 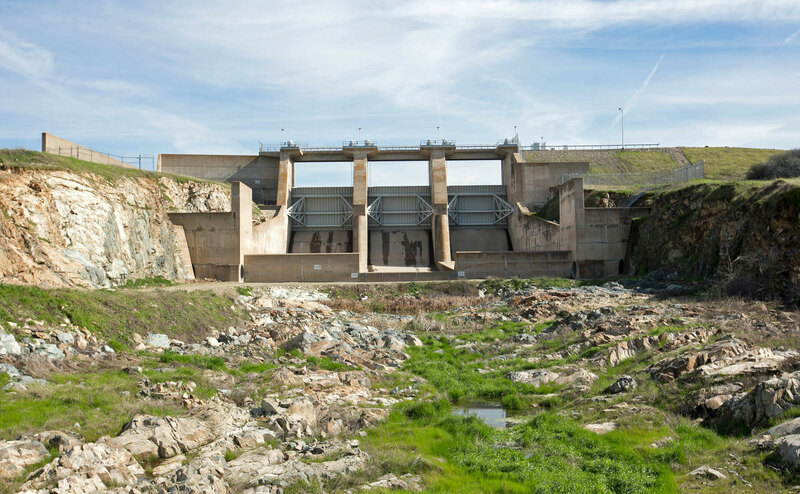 Smart says another constraint at Don Pedro is water that enters the Tuolumne River from Dry Creek, which further strains the river channel’s capacity. Flood information can be found at the Stanislaus County Office of Emergency Services.